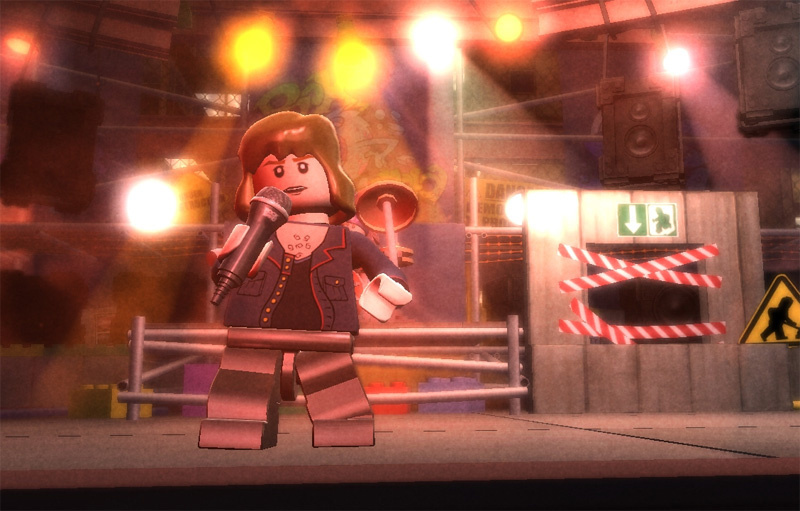 Oh my, LEGO Rock Band! Warner, TT Games and Harmonix join forces to bring you the latest in the new cross-over genre of LEGO and music - LEGO Rock Band! We'll be the first to admit we didn't see that coming... the LEGO series of games have always been of decent quality, obviously we're yet to see much of the game itself but it could be quite interesting. Update: We've been told that the first announced tracks to be included on the game are: Blur's “Song 2”, Carl Douglas' “Kung Fu Fighting”, Europe's “The Final Countdown”, Good Charlotte's “Boys and Girls” and Pink's "So What". More as we get it. Lego guitar amps, its just a big block of lego! lol! @SuperSonic1990 Have you seen a man eat his own head? also, I see this game being a let down, Rock Band is a good game, but I wasn't too thrilled while playing Lego Indiana Jones. I see this as trying to get more people to play Rock Band. I'm shocked that no information about the type of music to expect in this game has been released. It would be like me releasing a puzzle game, but not telling you what the puzzles are like. NintendoLife: So, Chicken Brutus, tell us about your awesome new puzzle game. ChickenBrutus: All of the characters are made out of Playdoh. NintendoLife: O...kay...but what do the puzzles actually involve? ChickenBrutus: This interview is over. What's the point of this now? Wow, this seems so behind the times. Might have been funny to do it last year, but there are too many music games on the market. And how can this compete with the Beatles release? They should just stick to what they do well - make a Lego Harry Potter game that the kids will love. Really Harmonix? This is just disgusting. Wow. That is... just wow. What songs will they include? What would work? It's just... WOW. They could have at least had the dignity to add it as a DLC update for RB2 - but this...? Just admit it, we ALL knew it was gonna happen. @#4: Is that a Team America reference? Well, as long as it isn't IDENTICLE to lego indiana jones, lego starwars or lego batman, then I'm in. But what could they do differently other then add some funny animations? It'd still be rockband, the lego would add nothing new other then some different visuals. It seems a lot of you don't have kids. The attraction is obvious to me. I don't want my (almost) 4-year-old belting out the lyrics to many of the regular rock band songs and the imagery isn't so great for her either. She is interested in instruments and playing music with us and this is a great way to make it work. Looking forward to it. I best not say owt. And to think that we though Guitar Hero had went overboard! This is juts ridiculous, what will the songs be? Twinkle Twinkle Little Star? Probably since it seems it will be for the kids and how exactly are they going to have a good game on the PSP I wounder, no touch and no ability for a grip like On Tour, Harmonix is going way overboard! Also yes Rock Band is going down the road in which they release everything they can, but LEGO'S? WTF! I still can't get over the fact that their making one for the PSP. Don't forget "She's a briiick...hooooooouse!" And, of course, It's Hip to Be Square. This is one combination I never saw coming. I really wonder what they where thinking when they thought up this idea. Update: The Final Countdown and Kung Fu Fighting have been confirmed for the game, LOL. It says that the game is dirceted towars kids, and there will be a DS version. I'm stunned to say the least, I wonder what music will be involved? This just seems..... I don't know! I thought guitar hero was getting ridiculous. But this?...wow....just wow. I am officially tired of Rock Band and Guitar Hero now. Let's just end all these silly sequels and spinoffs. XD Well it has The Final Countdown! Oh well I still only have GHIII and the first Rockband for the Wii I have been reluctant to pick up the newer ones up till now. I might pick up one or two this summer, but oh well. Ah hell no, this isn't happening. Funny, on this other forum there was a thread for the games you hope to never see and this was in the top 10. Getting Hit Will result in losing....your blocks. Hm, I look back at this old story, and I see the hate the hate that surrounded this game at first. But for me, I was really excited for this when it was announced. The DS version is great!